Home » Our Doctors » Larrance E. Larson, O.D. Dr. Larson earned his Bachelor of Science in Biology from Brigham Young University and Church College of Hawaii and Doctor of Optometry (OD) degree from Southern California College of Optometry. And recognized with the Northwest-Northern Award for Clinical Excellence in his senior year. He was born in Durango, Colorado and grew up in Torrance, California. Served as a Missionary in Japan for 2 1/2 years and in the Navy for 9 years. He enjoyed living in such places as Newport, RI, Charlestown, SC, 29 Palms, Ca and Okinawa, Japan. Dr. Larson and his wife Diane are kept very busy with their 5 children (Aaron, Michael, Connie, Erik, Lauren) and 13 grandchildren, ranging from 19 yrs. to 7 months old! 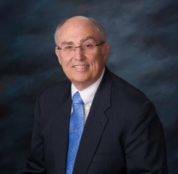 He still finds time to play golf, research genealogy and travel, and fulfill community interests by serving on the Vision One Credit Union board of directors and the Home Owners Association for a Ridgecrest community.